Our friend Zombie sent us a link to his new zoological survey of the life and customs of the San Francisco and Berkeley moonbats. He supplied it with some excellent commentary which you will agree is getting better and better. It's time we shared a little secret - Zombie also reads the People's Cube and is a captive fan of our site. agree once you see it -- it was the worth the wait! Is that Brinkie when she's been denied her vodka rations? why does everyone hate me so?? Hilarious. Now I won't be able to sleep for the next 4 hours. It is good to see at least some sort of coverage of our efforts. As you all know, the obvious reality is that all the major media outlets tilt toward the interests of their corporate sponsors, and the BushCo cronies bury any mention of a violent worker uprising. Hat's off to Zombie for catching the crazies in their natural environment and exposing their often violent and anti-American behavior and ideology on film. God Bless you, Zombie. You are doing the work that needs doing when no one else seems to care about, or even understand, the danger these fifth columnists pose. Thank you, and keep up the good work! Come off it, guys All of you should be ashamed of yourselves. Pop your eyeballs back in and roll up those tongues before you trip over them. SHE'S A PHONY! Really, guys. Your first clue should've been the lustful thoughts that entered your heads and elsewhere the moment you laid set eyes on her. Admit it. She's looks more like a digitally lobotomized, Faux News addicted, knuckle-dragging, Bush-worshiping 19 percenter than she does one of those brave, courageous citizens who take their lives into their hands every moment of every day, by standing up and speaking out against the oppressive tyrannies of the immoral, illegal Bush Administration. Clean hair. Fresh scrubbed look. Clean, neat clothing--in fact, I think I've seen that jacket for sale in the Cube store. Perky, well formed breasts well above the navel . . .
And she's handing out flyers? 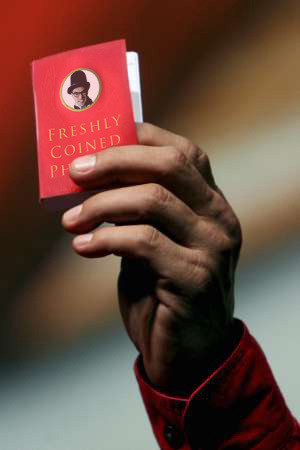 PAMPHLETS? Pfft! That is so-oo 1905 St. Petersburg! Why, I'll bet she didn't even have the decency to use an illegal printing press. Probably went to a corporate owned business like Kinko's. She should be holding up a crudely lettered sign, with a defaced picture of Bush! She should be burning Bush in effigy! She should be throwing fake blood everywhere! She should be dressed as either (a) Gitmo detainee, (b) Grim reaper sporting the nametape of an Iraq war fatality, or (c) Scary half-naked woman. Little Miss "Hot" (because I know that's exactly what all of you are thinking) has a lot to learn about how to look and act like a true Progressive. Nonetheless, I'd welcome her to join me and Pupovich for our "perch in" on that high rise ledge. I guarantee we can push persuade her to make the jump for peace and impeachment now! My goodness, Pinkie. You really do have a way with words. I believe I am more excited now than I was before! ...digitally lobotomized, Faux News addicted, knuckle-dragging, Bush-worshiping 19 percenter...oppressive tyrannies of the immoral, illegal Bush Administration...a defaced picture of Bush...burning Bush in effigy...throwing fake blood everywhere...dressed as either (a) Gitmo detainee, (b) Grim reaper sporting the nametape of an Iraq war fatality, or (c) Scary half-naked woman...peace and impeachment now! It's a good thing you didn't add "fascist, mouth-breathing, Neanderthals" to your description of the Bushies...I may have had a thrombosis! Why, thank you, Mikhail. I coined all those words myself, you know. LOL! Of course you did. At least you don't try to sidetrack every conversation down a trail of minutiae away from any relevant topic with specious and malicious personal attacks like some lockstepping brown-shirt. Freedom of speech is limited in many cases, as I'm sure you know. Mikhail, I'm laughing so hard I'm practically crying (which seems to happen to me a lot here). It might interest you to know this fine volume is also published in the U.K. and Canada under the title, The Complete Original Writings of Mikael Rudolph, and is listed in the U.S. Registry of the Top Ten Thinnest and/or Shortest Books Ever Published. At last a little red book for those of us who are borderline geniuses! I just checked and found out that The Mime has a YouTube account. Of the 9 videos he has there one is promoting his miming routine, and the other 8 are political propaganda advancing the cause of world socialism and Saddam Hussein. In the comment section to his miming video he diligently and courteously answers almost every post - in stark contrast to the "freshly coined phrases" he dispenses on his impeachmentland forum. You could never tell that Doctor Jackal and Mister Mime are one and the same person. 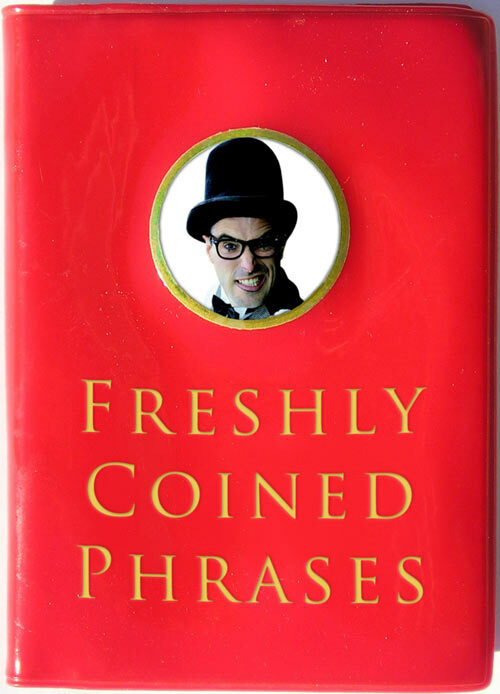 Here's a sample from The Mime's "Freshly Coined Phrases" book (posted in his YouTube comments). The Bush Administration is simply the worst, most darkly sinister and most evil group this nation has ever seen. Bar none. Just because I have figured that out doesn't make me closed-minded. <_shudder_> Please don't say that Director...I'm still frightened of that place. Please use "World Can't Wait false front" instead in sensitivity of my Eremophobia. Thank you for your awareness. I don't think this mime person is very nice. In fact I think he's a meanie. You forgot "knuckle-dragging"...shame on you! ...The Complete Original Writings of Mikael Rudolph, ...listed in the U.S. Registry of the Top Ten Thinnest and/or Shortest Books Ever Published. Oh, Mikhail, what do you expect from him? Everyone (81% of all 1,100 Americans) knows he's a liar. I love how the book is small enough so it can fit in your pocket, and you can take it everywhere you go. That way, if you should happen to run into one of those digitially lobotomized, knuckle-dragging, Faux News addicted, Bush-worshiping 19 percenters (who seem to be everywhere you go anymore, there's no escaping them), you'll have all the talking points you need to smack them down and mop up the floor with them--all in one handy little volume! Also, I was thinking of something For The Children: The Talking Mime Doll. (Maybe that sounds a little oxymoronic? Or just moronic.) Anyway, most talking dolls have no more than about 8 phrases in their repertoire, so The Talking Mime Doll would be perfect, because that's about how many he has that aren't copied and pasted from elsewhere. Just pull his string, and, "All personal attacks will be deleted." Pull the string again, and, "We're only trying to bring the digitially lobotomized, knuckle-dragging, Faux News addicted, Bush-worshiping 19 percenters to a civil level of discourse." Another pull, and: "Worst President ever. Worst Administration ever. Worst human being ever." Pull the string: "Have you anything of substance to contribute to this debate?" Pull one more time: "Anything at all?" I would also recommend adding a "drink and wet" feature to this doll. However, research has found that he doesn't necessarily need to "drink" in order to "wet."